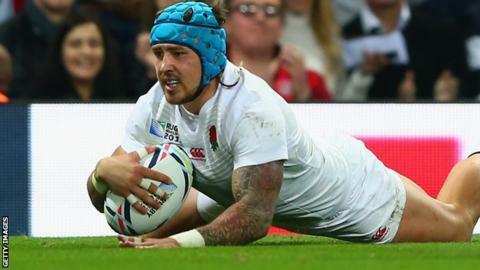 Exeter winger Jack Nowell says he is sad to see Stuart Lancaster leave his role as England's head coach. Lancaster gave Nowell his international debut when he started the opening game of the 2014 Six Nations in France. The 22-year-old has won 10 caps so far, although he started only one game at this year's World Cup, against Uruguay after England were already out. "Stuart was the one that gave me my first chance, so I'm a bit disappointed to see him go," he told BBC Sport. "He brought me to a home World Cup, so for me it's a disappointment. He's the guy that got me started, got me going, gave me my chance and had a bit of trust in me. "But the decisions aren't with the players, they're with the board." Lancaster, 46, left his position as head coach on Wednesday after England became the first sole hosts to exit a World Cup at the pool stages. Nowell has scored two tries in two games for Exeter this season as the Devon club have risen to second in the Premiership table after the first block of matches. And he says whoever takes over in charge of the national team, he must maintain that form if he is to play in next year's Six Nations. "The big thing we get picked on is how we perform at the club," Nowell added. "Whoever comes in, they're going to watch our games at club level and if they see we're playing well for the club they'll hopefully put us in the team."